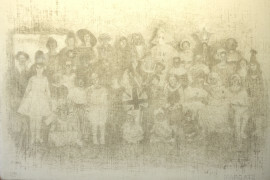 Images of Margate people dressed-up in tasteless costumes at parties or at carnivals is nothing new. This is a drawing based on a postcard image from 1930s’ Margate. 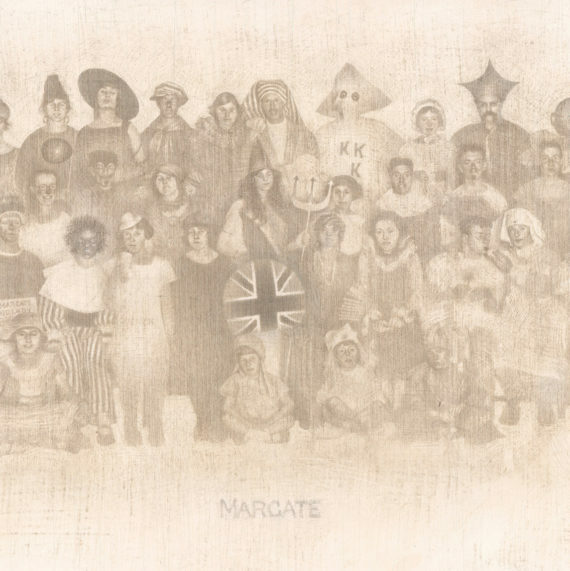 It’s part of an ongoing series of drawings of people dressed in fancy dress or in uniforms with a connection to Margate. The idea is to produce a series of drawings which bring to mind thoughts about culture, time and place through presenting drawings of people (the details of their clothing and so forth can imply a bigger, social and cultural, picture). This is a small drawing of about 14.5cm x 21cm in size which is based on the image on a postcard from Margate found in an antique fair near Nottingham. I’ve been making work about this picture, off and on, for a few years. I’ll write about it once I’ve made a proper work of art but for now here are some images. It’s drawn in metalpoint (silver wire on gesso). The physical characteristics of this medium emphasise the physical qualities of presence and trace and this fits well with my continued artistic preoccupation with human presence and the passing of time. I also find the medium very beautiful. I can never afford to make the work I’d like to make (the framing alone would be way beyond my means!) and so I don’t know how this work will develop. For example, I’d like to make a separate drawing of each of the people in this picture but I guess this will never happen. Nevertheless, I’m sure there will be other ways to make the art I want to make. I think of Drawing as a way of thinking: we make sense of what we see when we draw it. 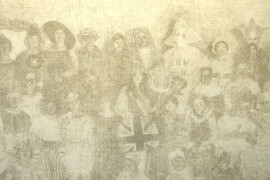 I can imagine a version of this work shown with other drawings to invite the viewer to make connections and question what is presented to them i the artwork. We’ll see if this happens. For the time being this drawing is a drawing that is on the way towards other drawings. I doubt if this one is going any further than facebook at the moment. I’ve never really had much confidence when it comes to making ‘Art’ and yet somehow I keep on trying. Most of my drawings never reach a point at which I’m happy for them to go out into the world as ‘proper works of art’. The number of works that do eventually find their way onto gallery walls represents just a tiny fraction of the amount of work I actually make. Most of my drawings become abandoned drawings. Occasionally I rework these drawings and sometimes they seem to come back to life. This drawing was abandoned a few years ago but I kept it because it seemed to have ‘something’ about it that seemed interesting. I worked on it again yesterday. The reason I worked on it was that all my other drawings were coming to nothing and it just seemed to make sense to re-work this old drawing. There’s a lot I could say about the origins and the thinking behind this drawing but I’m not going to do that here as the drawing might not be finished yet and I’d rather wait until it comes to rest as a settled work of art before I say much more about it. The person in the picture is my dad. It’s based on a photograph my dad took of himself in the back garden (in Margate, Isle of Thanet). Originally it was to be part of a series of drawings. Hand-made drawings of people are always something more than merely hand-made copies of pre-existing images. 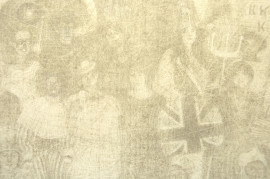 The medium forms part of a drawing’s meaning. I work in silverpoint on small boards coated in layers of gesso (this drawing is about 14.5x21cm). 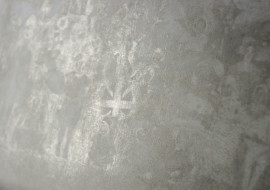 This is a medium which brings to the fore qualities to do with trace and presence (metalpoint drawings are formed of the traces of a point of metal drawn across the gesso surface rather like the mark a brass key might make if you were to drag it across an emulsion-painted wall). The tonal range of silverpoint lines is very slight and pressing the point harder won’t make the line any more emphatic – metalpoint lines have a gentle presence. This drawing is made up of a fine latticework of lines that are drawn onto and scratched into the surface. 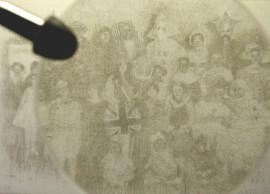 Close up the image disappears into a mesh of lines and scratches. 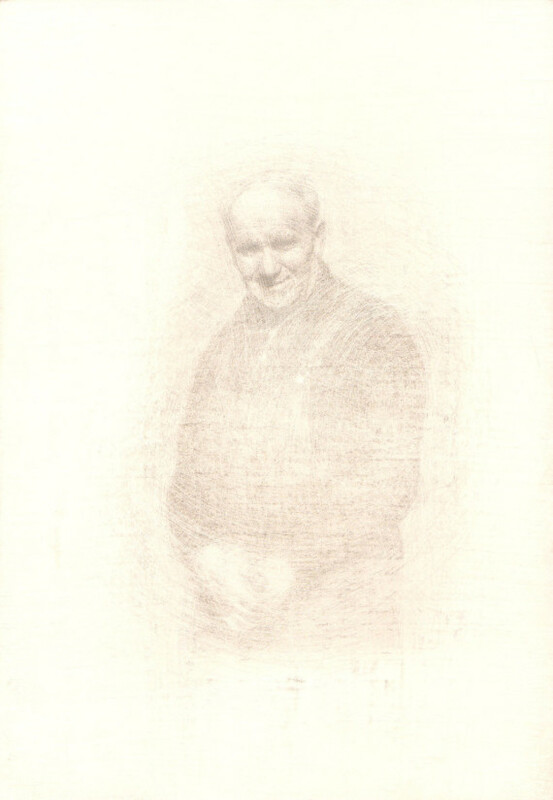 Silverpoint is an appropriate medium for an art about memory and presence. This drawing might or might not have come to its end. I can’t tell. For the time being it’s going back in the drawer.